Reserve City View Chalet Today! This is my second time visiting Tennessee. City View Chalet is a BEAUTIFUL CABIN!!! I read the reviews therefore I brought some things with me to accommodate my family. We had problems with the showers in all the bathrooms, the lady who answered that morning send maintenance to the wrong cabin. But never the less. The problem was resolved. I will visit a third time. My family was overwhelmed with the beauty of City View Chalet. We have decided to make it a vacation spot every year. We will visit again traveling from Houston Tx, and San Diego California. We were a little disappointed in the view. After all it was called "city view chalet" and there was only a view of trees. Apparently the photos were taken at a time when the trees were either not in bloom or not as tall. I want to start by saying my family and I loved our stay overall and would definitely book this cabin again. That being said, I want to address what others have said previously and then talk about what I personally thought. To address previous comments: As some people have said, the main floor is indeed warmer than the lower floor. However, it is not unbearable by any means. It is just a large, open space. Because of the house's positioning, the sun shines directly through the windows in the morning and it can feel warm if you sit in the sun. I would still say it was completely fine, though. To me the more important part is how it feels in the bedroom (I like to sleep in colder temperatures) and it was perfect. The beds weren't that bad either. I slept perfectly soundly. The view was mostly blocked by some trees, but if you look between the leaves you can still see some mountains. The view on the way up the mountain is redeeming, in my opinion. The water took a minute to heat up but it did heat up. I'm not sure the pans are cleaned between stays, so make sure you check those. What I thought: My absolute favorite part was the couches! Those are the most comfy couches I have ever had the pleasure of sitting on! Despite the growth of trees, there is still a great view, especially on the way up the mountain. The cabin is spacious, clean, and fun! It could use a couple updates, but nothing would absolutely deter me from coming back. We enjoyed it thoroughly. It would especially be great for having a lot of people to relax, shoot some pool, and take a nice dip in the hot tub. It needs more covers and some new shower heads, but it was still a clean and fun cabin. My family had a great stay . Overall our stay was fabulous and we had an amazing time. The cabin is in a great location with lots of room for three couples. The air conditioning needs to be checked. We called maintenance a couple hours after arrival because the temperature was too warm. The upstairs temperature remained uncomfortable on the main floor our entire time there. The heat from the fireplace doesn't help the fact that the air can't keep the cabin cooled. We were going to cook breakfast, however there wasn't a skillet large enough for our group. The addition of one or two large skillets would be helpful. The beds (mattresses and pillows) were uncomfortable. On an exciting note...we saw bears three different times! 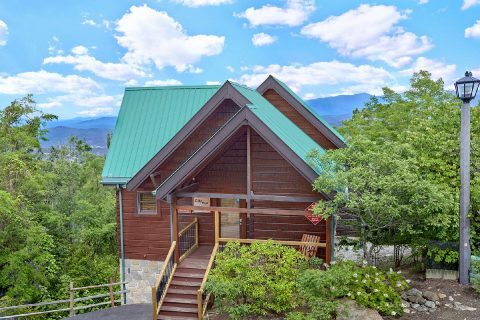 This cabin is very large and has a beautiful view of the mountains and Gatlinburg. This cabin can easily accommodate a large family or several couples. Most of the furniture looks new and is nice. This cabin had the MOST UNCOMFORTABLE BEDS I’ve ever experienced in a Gatlinburg cabin rental. They have to be at least 20 years old. When looking at them, you can see the indentation from where people have slept. I can not recommend staying here until these are replaced. There were several other small issues that wouldn’t keep me from staying here again, but that future guests should be aware of. The pans here are terrible, you may want to consider bringing your own. They didn’t have a can opener, and the wine opener was missing a handle. Overall, because of the mattresses, we will not be staying here again, and can’t recommend this cabin to others. Beyond beautiful cabin and location, worth every penny, highly recommend. The view was amazing, I know some of the reviews talk about the bad view, but the trees were bare so that might be why we had such an amazing view. Everything in the cabin was nice and up to date. The only complaint I have is that some of the dishes had residue in them, so make sure you check before using them, and that we also had some small tiny ants in the front right bedroom bathroom, not a lot, but enough to notice. Coming here for spring break with myself and five friends was an amazing time and I highly recommend this cabin to everyone, you won't regret it at all!! Our stay at City View Chalet was wonderful! The cabin is beautiful and we enjoyed the jacuzzi and the fireplace. The mountain views were real nice, especially in the morning. The trees had grown and were blocking some of the Gatlinburg view. It's a short drive down to Gatlinburg. We enjoyed our stay, and we will reserve through your company again; however, we will not stay at this property again. The air vents on the main floor were covered by furniture, or closed, which did not help with the difficulty of cooling that floor. We were able to uncover them; it would be good to mention this to future guests. The Wi-Fi was terrible. We had to stand in one place inside the cabin in order to have any reception. For a few days, we thought there was no reception at all. The beds are old and really need to be replaced. The cabin met our needs. Everyone had a bed and there are plenty of bathrooms. It was particularly nice to have a bathroom on the main level, as well as one for every bedroom. A few more towel bars in the bathrooms would be very helpful. Probably the most disappointing part of our stay was the fact that there was no view. We had read reviews before booking City View Chalet, and many had noted that the name of the cabin should be changed because you could not see the city. We were not concerned with seeing the city, but we did hope for a view of the mountains - it's pretty much the reason you book a cabin high on a mountain in TN. Thank you for taking the time to let us know about your recent stay in City View Chalet! We here at Cabins USA strive to give each guest the best stay possible while vacationing in the Smokies. When you are ready to stay with us again, please mention you are a return guest for an additional discount. Thank you for choosing Cabins USA and we look forward to seeing you again soon! Was a wonderful cabin, very pretty and spacious. The only complaint I would have is that the kitchen was not well stocked in supplies for cooking. It was hard to cook for 9 people with the pots and pans supplied. Other than that it was wonderful! I am so happy to hear that you enjoyed your stay in City View Chalet! We here at Cabins USA strive to give each guest the best stay possible while vacationing in the Smokies. Than you for letting us know about the cooking supplies. Our housekeeping supervisor has been notified and this will be addressed. Thank you for choosing Cabins USA and we look forward to seeing you again soon! Call customer service twice and after long wait online was sent to a voice mail. Left two messages and was never answered. On check out, the instructions were to call to check out but phone was never answered. Very poor service. This is the first time staying in a cabins usa cabin and we thoroughly enjoyed every minute of our stay. From the time we booked the cabin till we checked out everything was perfect. Cabinsusa makes it so easy, we have no complaints about anything. We even got to see a bear and her cubs which was a plus for this vacation, we will not stay anywhere else. We will be staying with cabins usa from now on. The cabin was so comfortable and the hot tub and pool table were nice. Thank you cabins usa and your staff for making our vacation wonderful. We loved the cabin and its location. The ride up was a little scary but once you learn short cut it wasn't that bad. The cabin had everything we needed and then some. The carpenter bees are destroying the awning, hopefully the damage can be fixed. Overall we were very satisfied with cabin and the spectacular view. We are planning to rent from Cabins USA again!! Thank you for taking the time to let us know about your recent stay in City View Chalet! We here at Cabins USA work hard to make sure each of our guests have the best stay possible while vacationing in the Smokies. When you are ready to stay with us again, please mention you are a return guest for an additional discount. Thank you again for your review and thank you for choosing Cabins USA! The cabin was pretty much what I expected from a mountain cabin. My family prefers renting a house for vacations to cook some meals at home, the kitchen was not equipped for this at all. There were 7 forks for a cabin that sleeps 8, one bowl large enough to mix anything and a large stack of plates that were dirty after you got passed the first 5 in the stack. The only other complaint was related to the bathroom where the floor tiles were all loose. This were all minor things we could deal with for our short vacation, the view and hanging out on the deck for a couple of days with beautiful weather were worth theses few hassles. I would use Cabins USA again to book as we had no issue with that process however we would probably not rent this particular cabin again. Overall stay at the City View Chalet cabin was great. The last night was a bit uncomfortable due to the fact that a rat came out from the kitchen, and we had to stay up all night to catch it and get rid of it. We did contact the cabin USA staff about the situation in which they stated that pest control was going to come out to address the issue. They then contacted me back and stated that pest control would not come out until the morning. I was not satisfied with that response so I took it into my own hands to get rid of it because I had small children in the cabin. It was a beautiful cabin and we had a wonderful time except for the last night. We would love to have had Christmas decorations. Also more garbage bags since we didn't take any with us. Thank you for taking the time to let us know about your recent stay in City View Chalet! We here at Cabins USA work hard to make sure each of our guests have the same great stay you enjoyed while vacationing in the Smokies. When you are ready to stay with us again, please mention you are a return guest for an additional discount. Thank you again for choosing Cabins USA and we look forward to having you as our guest again! We chose this cabin based on the view in the pictures. We were excited to have a "280 degree view." However, we were disappointed that most of the view was obscured by the trees. Also, the carpet in front of the laundry room had a stain and was wet from a leak. Inside the laundry room, there was black mold on the walls. The foam in the hot tub cover was all broken into pieces, which made it hard to cover the hot tub and we also noticed small pieces of foam floating in the water. There was a notice posted on the wall that there would be a fine for anything found in the water or any damage to the cover, even though the cover was a wreck and it appeared to have been that way for some time. We loved staying at the cabin! Saw 2 bears while we were there which was the highlight of our stay! There was plenty of room in the cabin and everyone was comfortable. A little warm upstairs during the day because of the windows but we brought a fan and kept it running on the stairwell and that helped a lot. We have been staying in cabins owned by Cabins USA for over 5 years now and every time we are so pleased with our stay. The grill ran out of propane while we were cooking and I called the maintenance number and they brought a full tank for us and took off our extra trash while they were there. One of our kids also left their DS behind and we called and they found it and shipped it back to us. They are a very nice and accommodating company. I enjoyed the tips others had for this cabin before our stay so here are a few of ours (they were important to us but may not be to you)....definitively bring a fan to help cool upstairs. We brought plastic bowls since we eat cereal every morning and there were not good cereal bowls there. Bring good trash bags, hand soap for kitchen sink, and your own toilet paper (they have motel quality tp there). Oh and look at your map there is a GREAT short cut off the bypass (Campbell Lead Rd exit) that cuts off a LOT of time going back to the cabin. Look it up! Thank you for all of your kind words and suggestions! We here at Cabins USA work hard to make sure each of our guests have the best stay possible while vacationing in the Smokies. Thank you for continuing to choose Cabins USA and we look forward to having you as our guest again! Very nice view great time!! We loved the cabin-beautiful views even though it should be renamed mountain view cabin (you can't see the city because of trees). The air is inconsistent - hot upstairs -freezing downstairs. Very nice cabin - be careful of the bears! A bear came right up to the back end of our car and was looking in when we left the back hatch open while packing! Had a great stay! Cabin is way up in the mountain but very close to town at the same time! I think the view would have been amazing but going in the summer it was very overgrown. Cabin was perfect except for the air conditioning. The bottom floor stayed freezing cold trying to keep up with the upstairs. In the mornings the upstairs would be 80 degrees and didn't cool off until late in the evening. Then you froze at night. However the floor plan was perfect! I would recommend this cabin! Thank you for taking the time to let us know about your recent stay in City View Chalet! We here at Cabins USA work hard to make sure each of our guests have the best stay possible while vacationing in the Smokies. I apologize for the issues you experienced with the air conditioning. Maintenance has been notified and will be looking into that issue. When you are ready to stay with us again, please mention you are a return guest for an additional discount. Thank you for choosing Cabins USA and we look forward to having you as our guest again! Our stay was great! We loved the cabin. It was clean and the view was great! Although, the cabin doesn't provide but 2 trash bags, the grill doesn't work, you will need to bring your our own coffee and coffee filters, the location states you have access to a pool but that isn't the case. Also, towels are taken to the Cabins USA main location in Pigeon Forge to be exchanged out. However, we will stay again in the future and will just know to bring some items with us. Thank you for taking the time to let us know about your recent stay in City View Chalet. We here at Cabins USA work hard to make sure each of our guests have the best stay possible while vacationing in the Smokies. I apologize for the confusion regarding the pool access. Management has been notified and will be correcting that issue. When you are ready to stay with us again, please mention you are a return guest for an additional discount. Thank you for choosing Cabins USA and we look forward to having you as our guest again! It's defiantly a hike up the mountain, but so worth it! Some of the views on the way up are absolutely gorgeous. The chalet is amazing, although I wouldn't recommend it for small children (we had a 3 year old and two 2 year olds and the steps became a game for them). As stated in other reviews the drive up to the cabin is extremely steep. I would only recommend vehicles with larger engines. The cabin had everything we needed. My only complaint was the grills igniter was broken. So we had to use a lighter to get it lit. The view in the pictures isnt exactly what you see. The trees have grown up since the pictures were taken. Still a gorgeous view but we were let down by it. Make sure you have no food left in your car. We had a bear trying to get into ours in the middle of the night. As for the company I have absolutely no complaints. Check in and out were a breeze! Thank you for all of your kind words! We here at Cabins USA work hard to make sure each of our guests have the same great stay you experienced while vacationing in the Smokies. Thank you for letting us know about the grill igniter. Maintenance has been notified and will be correcting that issue. Thank you again for your review and we look forward to having you as our guest again! This is our second year renting with Cabins USA. The process is straight forward and worked well. City View Chalet worked well for our group. One mishap was being told in our electronic check in that the cabin included access to a resort pool and asked to stop at the office to pick up the access key. (This was somewhat unexpected, but we braved the parkway traffic to stop in and pick up the key only to be told that it was a seasonal outdoor pool, and not open.) It would seem that this was an avoidable mistake. While the cabin was nicely constructed, it is showing some signs of wear and neglect that the owner should address. The deck is in bad need of repair with some loose and rough boards. Most of the windows lacked screens and one in a bedroom was screwed shut. Only one of the 3 provided pool cues had a tip on it. As others have noted, lighting in the living area is sparse. Reading at night was a challenge. Tile in the bathrooms was cracked and loose and showed signs of mold in the grout. Overall cleanliness was average, the floors and major surfaces were all clean, but anything above eye level was clearly in need of a dusting and deep cleaning. The broom closet was lacking a broom, so keeping the floor clean during the week was a challenge. There was some evidence of ants in the cabin which we reported. I expect this is nearly impossible to eliminate in the mountains. Morning sun was an issue with no curtain to pull across the east facing A-Frame window. This would be a nice addition for the owner to make. Parking was tight as was mentioned in other reviews, but adequate for a minivan and small SUV that we had. Overall, a very satisfactory stay. bathroom tiles were broken,and need a deep cleaning there were alot of dust and spider web,the pool table stick were broken and some roaches. No brooms to sweep. The cabin was nice and the view was great. It could have been a little cleaner the showers had mold in them. One of the beds was broke and kinda patched up. Very nice cabin up on the mountain. And by up I mean up. It sita at about 3,000 feet and has some stunning views. We all really enjoyed our weekend staying at the cabin. Parking is a little tight but we were able to fit three vehicles in the parking area. We would definetely stay here again. I am so happy to hear that you enjoyed your stay in City View Chalet! We here at Cabins USA work hard to make sure that each of our guests have the same great stay you enjoyed while vacationing in the Smokies. When you are ready to stay with us again, please let our reservationists know you are a return guest for an additional discount. Thank you again for choosing Cabins USA and we look forward to seeing you again soon! The cabin was beautiful and so was the view! The upstairs stays a little warm due to all the windows but they allow for such a beautiful sight it made up for it! A couple of the beds have slumps but overall it was great. We had 4 adult couples stay and it was plenty of room. Just be prepared for an exciting drive to get there! Oh and we had 2 bears beside our deck! Wonderful time!! I am so happy to hear that you enjoyed your stay in City View Chalet and were even able to see some of the local wildlife! We here at Cabins USA work hard to make sure that each of our guests have the same great stay you enjoyed while vacationing in the Smokies. Thank you for letting us know about the issue with the beds. Your comments have been forwarded on to our Owner Liaisons and they will be speaking with the owner of the cabin regarding these. Thank you again for your review and thank you for choosing Cabins USA! We have a good time. Had some issues with the TVs not working and parking. Did get to see some bears with one being in a car. The back door to the deck is hard to open. I am so happy to hear that you enjoyed your stay at City View Chalet! When you are ready to stay with us again, please let our reservationists know you are a return guest for an additional discount. Thank you again for your review and we look forward to seeing you again soon! We booked this property about 9 months ahead of time and I was torn between several cabins which all sounded great. I obsessed over the photos and reviews and ultimately chose City View. The negative reviews were right on....the road up to the cabin takes about 15 minutes from town and it is VERY steep and narrow. We ended up altering our plans so we could only have to go up and down the road once a day whenever possible. And the parking IS tight. Not just because there are only two spots but because the spots slope down so much (had to leave our parking brake on) and are pretty short. I was glad we did not have a full size truck or it would have been sticking out into the road! The cabins are right on top of each other and the whole street is congested with other people parking and construction of a new cabin. That being said, the neighbors did not bother us at all and we never heard anyone from inside the cabin. The pros: The view was gorgeous. My kids loved the hot tub and pool table. The cabin was clean and for the most part comfortable. It was decorated very nicely and we appreciated the comfortable couches. There was plenty of room for my family of 5. The cons: It was very dark on the main floor at night which made it really hard to read or play card/games at the table. The cold water did not work in the back bedroom with the king bed. The deck boards on the back deck are in rough shape so watch your step. The mattresses on all the beds need be replaced, they are very worn and not very comfortable. Helpful tips/things I wish I had known before arriving: Bring a baking sheet and cereal bowls if you need them (their bowls are either huge or tiny). We ended up buying some at the grocery store. It gets very hot on the main floor during the day (nothing to block the sun and you can't set the A/C below 70) but if you put a couple of fans on the a/c vents and point them up at the ceiling it really helps cool it down. We brought a lamp up from one of the bedrooms to put on the dining room table. If you have your own pool sticks, bring them...the ones provided are broken or bent. We really did enjoy our stay, there is so much to do in the area. I would book with this company again, though I would probably chose a different cabin. Everything is easy with cabins USA. Location. Cabin. Super! We did have a bear in our drive, which is super cool. We just stayed in and watched out the windows. Parking isn't as bad as I have read on other reviews. Thank you again! Thank you so much for all of your kind words! We here at Cabins USA work hard to make sure that each of our guests have the same great stay you experienced. When you are ready to stay with us again, please make sure to let our reservationists know you are a return guest for an additional discount. Thank you again for your review and we look forward to having you as our guest again! We enjoyed this cabin tremendously. It was one of the nicest cabins we have ever stayed in. The view was absolutely breathtaking. The staff was even more friendly than I remember. There were a few minor problems upon arrival. The beds were not fully made and the pillows were thrown on the ground which made me think that we possibly didn't have clean sheets. Also there were used towels and wash cloths laying around that were clearly not clean. Another thing is that the trash from inside the cabin was still full so I had to gather all of the trash and get someone to come pick it up. Other than that, the cabin was amazing and even though I had these problems I would still recommend renting this cabin. Thank you for your kind review! This property definitely has amazing mountain views! i apologize for the cleanliness issues you experienced during your stay. This is definitely not the typical Cabins USA experience. Housekeeping will be notified regarding your stay. Thank you again for your review and we look forward to having you as our guest again! The chalet was outstanding. One of the prettiest places we have stayed thru Cabins USA! Would highly recommend it to anyone. The only problems we had, was where it rained, there were 2 leaks. But when we called, they sent maintenance to check it out right away. And there was a problem with the bedspread in one of the rooms. But they took care of that, too. And the cage that is outside for the trash didn't have a good bear proof lock on it. The one that was on it was twisted and there was a padlock hasp on it but nothing to secure it shut. They customer service was excellent! Thank you Cabins USA for a great stay!!!!!!!!!!!!!!!!!! We were very happy Campers!!!!!! The cabin was beautiful and Cabins USA is top notch. This cabin was very high on the hill and due to my fear of heights we had to change cabins. Cabins USA was very understanding and accomodating. Will definitely use them again! Had a great time at this beautiful property. Things were top shelf. Wonderful time for anyone wanting hassle free experience. Managed by true professionals. Everything was perfect except not having chairs to sit at dining table nor bar stools to sit at bar on kitchen island. I noticed several people have posted the same problem. If owner can't afford to buy a new table with chair nor bar stools, maybe we renters can make small donations to help out. My family will definetly stay there again. The view was beautiful! Thank you for your review. We apologize for any inconvenience this may have caused. We had to purchase new chairs for the cabin due to damages to the original chairs. We have been waiting for them to be delivered. Thank you for your feedback on your stay, and we look forward to seeing you again soon. Our family enjoyed this cabin so much!! We plan on making this cabin a must for our yearly family trip to Gatlinburg!!! Staff was helpful and nice and cabin met and exceeded our expectations! Very clean and just as discribed! I would like to start by saying that this was the third time that I have rented a cabin through Cabins USA and each time has been very easy. City View Chalet, was beautiful and very comfortable. The only real complaint we have, is the parking spaces are very bad!!! We actually only had one and it was very hard to get in and out of with our Town and Country minivan. The people in the cabin next door had a big white pickup truck that took up his space and our second space. The cabin didn't have any hot pads or dish towels and the dining table was way to tall for the dining chairs provided. That said, the view is wonderful and sunrises beautiful. I wouldn't stay here again due to the drive up and down the mountain. The road is in great shape, just didn't like the climb up and the ride back down, around 4 miles one way. Going to stay on flat ground next time. Thank you for your review. We are glad that you had a great stay with us at City View Chalet. We apologize for any inconvenience regarding the parking at the cabin. We do not currently own the cabin next door to City View Chalet, or we would have been happy to try and assist you with your additional parking space. We are in the process of ordering new chairs for the dining table, but we wanted to insure the cabin had temporary dining room chairs until the ones we ordered arrived. We appreciate your feedback on your stay, and please feel free to give us a call for your next Smoky Mountain vacation, and allow us to assist you in finding the cabin that is perfect for your needs. I found the cabin to be dusty, but I might notice this more than others, due to the fact I have been manager of house keeping dept. in a resort hotel. The view was outstanding, we all enjoyed it a lot, the drive up...not so much. LOL We did have an incident with the cabin next door. He parked in our second slot then with his second truck, took up one and a half spaces. We of course had to take someone else's slot. No one could get the people in the cabin to answer the door, so the third party called the police. They wouldn't answer for him at first till he put on his siren. They did finally moved. They were very rude to all of us including the officer. I know the parking spots are marked and common sense should prevail, but maybe a verbal comment to that fact at check in would help. All in all we had a very nice time and would love to come back, but price is a little steep for us oldies on fixed incomes and the 9 hour drive can get weary. But will certainly try!! Thank you for taking the time to write your review. We are glad that you had great stay with us at City View Chalet. We apologize regarding the parking; however we privately manage individually owned cabins; therefore, we do not own all the cabins in the areas or the resorts. We hope that we do hear from you again soon, and do not forget to ask about our additional return guest discount. The view from this cabin was amazing. It took our breath away. The bedrooms and bath facilities were comfortable and clean. However, there was only one chair for the dinning table and it was falling apart. The three bar chairs around the small kitchen table were ok, but I had to repair one that was also falling apart. Had I not repaired that chair some one in our party would have been serioursly hurt. The BQ grill is old and needs to be replaced, We had to cook on the grill using aluminum foil. The location was excelent and only a short drive to everything. The TV in one of the bedrooms is not connected to cable but can be used to play your movies. I would recommed this cabin even with the above issues because of the view of the mountains and the location. Thank you for your review Lemuel. We appreciate all your feedback. We apologize for any inconvenience you may have experienced during your stay. I have had maintenance look into all the issues. We are delighted that you did enjoy the view of the Smoky Mountains and we hope that we will hear from you again soon. The cabin needs to be update. Tv in one bedroom as 2 channels. Pool sticks are all broke. The view was great The parking needs to be improved very little space to park. Thank you for your review. We appreciate your feedback. This cabin does provide cable, but the bedroom on the bottom level does not have the cable set up. We apologize if this inconvenienced you at all during your stay. Also, the cabin only has parking for two cars due to the location of the cabin. We hope that we will hear from you again soon. Please feel free to give us a call and we can help insure you have a cabin that fits all your needs during your stay. The view was beautiful both at day and night. It was wonderful time and a great vacation. We wanted the mountain view and got it. For sure come back. Thanks Cabin USA. City view chalet located in smoky mountain village has the best view of any cabin I have stayed in Gatlinburg. The cabin is very close to the highest point in Gatlinburg. At night you see the lights of downtown Gatlinburg and Pigeon Forge. You also catch a little glimpse of the ski slopes at Ober Gat. The cabin was very nice. It could have been a little cleaner however. For me it's all About the views so we enjoyed it. We went up Thanksgiving week and had a blast. It snowed and it was beautiful. We loved the cabin, but felt somethings needed to be updated or fixed. One of the bedrooms was always cold and another was toasty warm. I did hate that it only had two parking spots. The cabin in far up the mountain with a lot of twist and turns. I liked it but, my parents did not. It would have been nice to have wifi access. We had fun. The house was really nice. Loved having the flat screens in each room. My only recommendation would be to add something to the bathrooms to have a place to set toiletries. Every bathroom has a pedestal sink so you have to set items on the floor. I would also recommend the house have a hair dryer, I never bring my own since all hotels have them. In the kitchen, it would've been nice to have coffee and filters, there was a coffee maker but no coffee. All in all, the house was a very good value. I would consider staying there again. Our cabin, City View Chalet, was absolutely beautiful! Our family made some wonderful memories there. We have already recommended these cabins to our friends. We definitely plan to be back! Had a great vacation and very much enjoyed City View Chalet. We even saw a bear one morning. Only have 2 points of concern and neither are major. 1) It would be nice if your description on the web site mentioned that you only get 2 parking spaces. It's a 3 bedroom chalet so we had 3 families with 3 cars. Sometimes had trouble finding a place to park 3rd vehicle. 2) The description from the website mentions a gas grill. When we got there the grill could not be found. We saw where it was supposed to be sitting as we saw the propane line but no grill. We wouldv'e BBQ'd had we had the grill. Not until the 3rd day did someone find the grill. It had been moved to the side of the house. We were not comfortable with bringing the grill through the middle of the house and then hooking it up to the propane line. Not a deal breaker but a little disappointing. everything was great!!!! EXCEPT it didnt appear to be dusted for quite sometime,and the dryer lint hadnt been cleaned out in forever (fire hazard). But those are just minor things! Loved the view and location! We have been several times to Gatlinburg and Pigeon Forge and CABINS USA is the only way for us!!! Lots of great memories were made and we cant wait to return! This is a great cabin and we had an amazing time, the only thing I would suggest is that you tell people just how far up the mountain it really is. I was pleased with the cabin and everything, but I think next time I will check to see just how far up the mountain it is by calling and asking someone. I am trying to plan another trip with family memebers for the spring!! Thank you for choosing Cabins USA Gatlinburg. We are so happy to see that you enjoyed your stay in City View Chalet. We hope to see you again soon. We really enjoyed our visit and the cabin was definitely the way to go. Very clean and cozy. We will definitely be back. Thank you for choosing Cabins USA Gatlinburg. We are happy to see that you enjoyed your stay in City View Chalet. We hope that you will stay with us again soon. The door was left open to the porch off the bedroom. The grill didn't work we called early in the morning to ask about the grill we were told that they would get us one. We got back to the cabin around 2:00 planning on cooking out but had no grill we called and was told it would be several hours before they could get us one. We bought several dollars worth of groc. planning on staying in and cooking out with our family. The staff said they were sorry and that was all they could do. We got the grill around 7:00 that evening. I understand that things happen but if you advertise having a grill their should be a grill. This should have been checked when the cabin was cleanned. The staff seemed a little put out with us because we were upset over not having a grill. We paid alot of money to rent the cabin we should have had what was advertised if not DON'T rent the cabin. Never had any problems with usa cabins before but will go with someone else next time. We were expecting a better view. My sisters and I along with our families rented this his cabin to surprise our mom on her 70th birthday. The cabin was exactly like the pictures on the site and we all had a wonderful time - a few of the family members spotted a bear and her cubs while walking to the entrance - that was exciting and the view from the balcony was spectacular! It may have been better if the trees could have been trimmed down a bit - but overall - the view is fabulous! Paving the parking area would be a suggestion and easier when trying to park or leave. Overall our weekend was great and we are hoping to do it again. everything was great. We had a great time the cabin was beautiful. We had an awsome time! The cabin was more than we expected.....We plan on returning next year and staying once again in "City View Chalet"! Thank you for choosing Cabins USA Gatlinburg. We are so happy to see that you enjoyed your stay in City View Chalet. We hope that you will visit us again soon. Upon arrival we were very pleased except the parking. We drove in with a conversion van which felt like it was going to fall off the edge. Cabin is beautiful inside and a great value. The hot tub was a lounger for two so 4 people could not fit comfortably in it without two people being up to their neck in water and the other two out of water. Views were great and each person felt their bedrooms were as good as all other. Please don't throw beer cans over the rails, this is much too pretty of a place to litter. We were so pleased with everything about our stay at the City View... it was amazing! The location was perfect; it was everything we hoped for! We even forgot a blanket that I was sure we would never see again but I was wrong I got it back yesterday! We are definitely going to stay here again next year! parking is kind of ockward, hopefully it will be paved so the van can fit properly. Thank you for staying with Cabins USA Gatlinburg. We are so happy to see that you enjoyed City View Chalet. We hope that you will stay with us again in the future. This chalet was awesome! The view was breath taking, and the cabin felt like home. The only complaints that we have is, there were light bulbs that were blown, and the lights in the half bath seemed to have an electrical short. This is something that the maintence staff needs to keep up on. Other than these two things, it was a wonderful place to stay. Thank you for contacting Cabins USA Gatlinburg. We are happy to see that you enjoyed City View Chalet. Maintenance has addressed the issues you mentioned. We hope that you will stay with us again in the future. We loved our stay at this cabin!!! Thank You!!!! Thank you for staying with Cabins USA Gatlinburg. We are so happy that you enjoyed your stay in City View Chalet. We hope that you will visit us again soon. However we love ever minute and would go back.